Hey everyone!!! 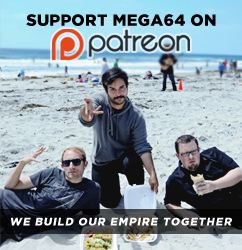 Who is ready for the 510th episode of the Mega64 podcast??!?!?! In this episode: Texas flu, Spider-Man PS4, Resident Evil 5, Xbox Game Pass, filming Youtubers React, Derrick’s Spirit Board, books, making Todd & Aaron 2018, new Mega64 shirt design, PPS #300, freestyle raps, Celeste, and come see us at PAX South! Click here for the audio version!